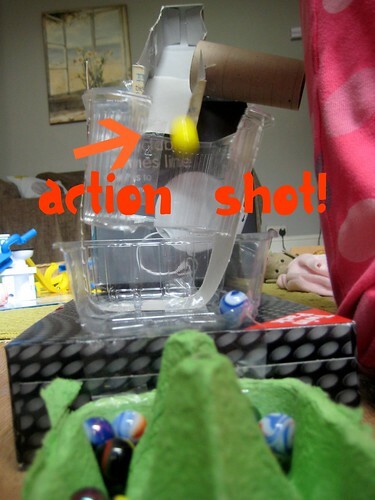 How to make a marble run, a great junk model construction challenge. 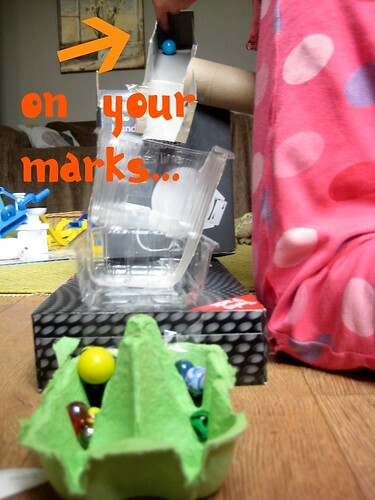 We always have a well stocked making box ready to create with but it was a bag of colourful marbles that we found in a charity shop that were the inspiration for this marble run. It’s all B’s creation and she had to use lots of problem solving and adaptations a she went along, to make a marble run that would be fun to play with. Here’s how she made it. The basic materials B used are cardboard and plastic boxes in various shapes and sizes all stuck together with sticky tape. 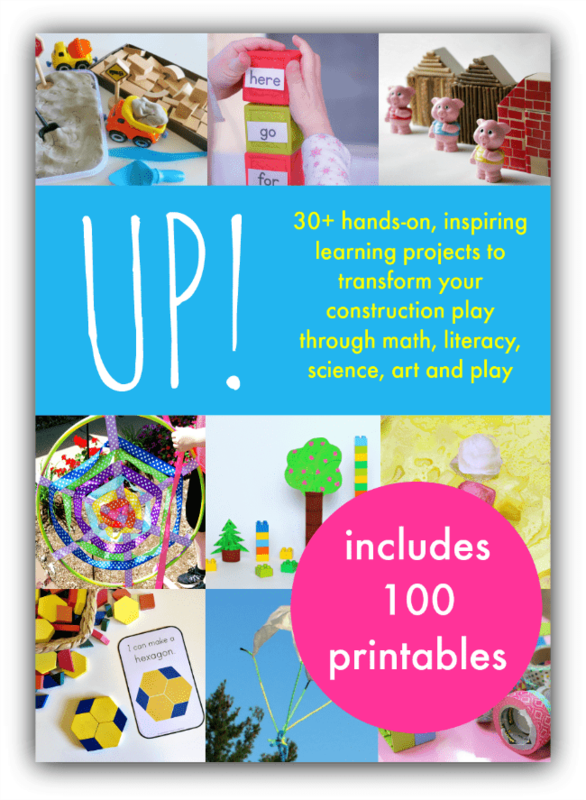 (Regular readers know my girls will not hang about waiting for glue to dry.) Doors were cut out with scissors and toilet roll tubes uses to create tunnels. B had to do some problem solving and make some adaptations to get her marble run on the right level so the marbles would indeed run, rather than come to a halt half way down. Creating tilted layers was the answer. She added in some excitement by making it so there were two ways the marble could go – with a toilet roll tube trap sending the marble out of the game into a penalty area. 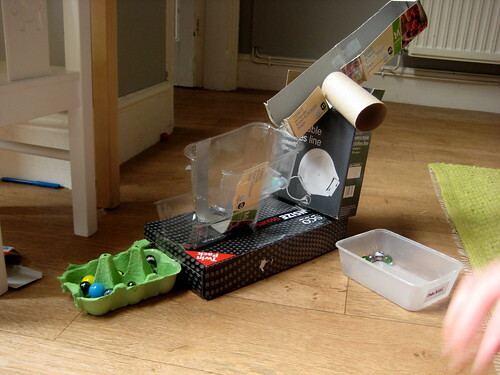 The egg box at the end is a great way to catch the marbles, so they don’t end up skittering all over the floor and also lets you turn the fun into a game. 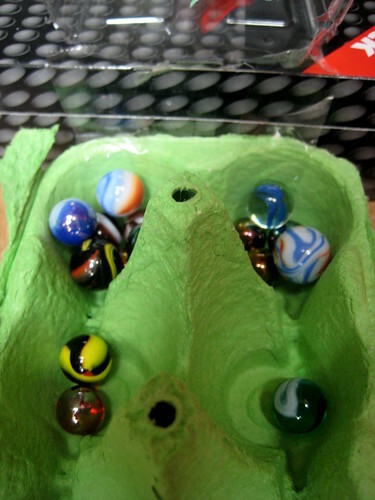 Allocate a score to each section of the egg box and collect points to see which player becomes Champion of the Marble Run. GREAT marble run! We used tp rolls on the fridge last week = so much fun! Can’t wait to explore your ideas here thanks for sha ring! Awww how fun! clever idea too! I love that! We are going to do it this afternoon! 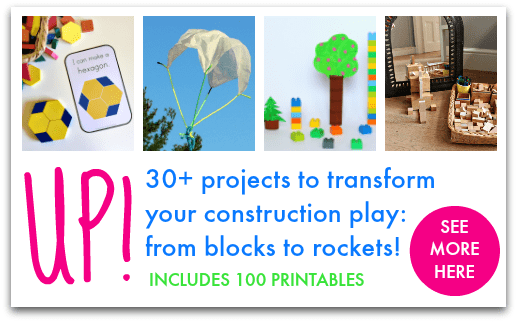 Thank you so much for linking up with Fun Sparks. I love the action shot! I need to get some marbles or something to send down a run so we can do this! Thanks for linking it up to Monday Madness, I always love your junk creations! This is a great thing for my son. he loves to make things he can play with later.